Games Like Mass Effect '+g+"
Mass Effect is a series of science fiction action role-playing third person shooter video games developed by BioWare and released for the Xbox 360, PlayStation 3 and Microsoft Windows, with the third installment also released on the Wii U.The series has been a major critical and financial success. All three games have received critical acclaim for their storyline, characters, romances, voice acting, choices and the depth of the galaxy. 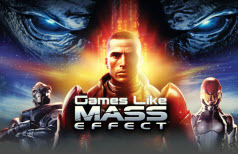 If you are a fan of action role-playing games like Mass Effect and looking for more games with similar gameplay then find the recommendations for it below and don't forget to mention if we miss any games as we keep on updating this list. Alpha Protocol is an action role-playing stealth game developed by Obsidian Entertainment and published by Sega. The game is played from a third-person perspective where the player plays the character of a trained CIA operative who is the newest member of "Alpha Protocol", a clandestine service established to perform covert operations. Deus Ex: Human Revolution is a cyberpunk-themed action role-playing video game developed by Eidos Montreal. The game is set in 2027, 25 years before the first game in the series, at a time when multinational corporations have grown in power beyond the control of national governments. Dragon Age II is a fantasy simulator video game developed by BioWare, and published by Electronic Arts. The player assumes the role of Hawke, a human mage, warrior, or rogue who arrives in the city of Kirkwall as a lowly refugee but becomes its legendary champion over a turbulent decade of political and social conflict. Star Wars: Knights of the Old Republic is a role-playing video game developed by BioWare and published by LucasArts. The game is set approximately 4,000 years before the rise of the Galactic Empire where the player plays as a young Jedi Knight, charged with leading a group of freedom fighters across the galaxy. Fallout 3 is an action role-playing open world video game developed by Bethesda Game Studios. It is the third major installment in the Fallout series. The player character is an inhabitant of Vault 101, a survival shelter designed to protect up to 1,000 humans from the nuclear fallout. The game has an attribute and combat system typical of an action strategy game. Sacred 2: Fallen Angel,.....if you can think of more, then don't forget to mention it in comments.